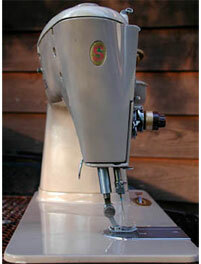 The Singer 500A Slant-O-Matic is sometimes referred to as the "Rocketeer" due to its space-age styling. After the Singer Featherweight, this machine seems to have the greatest following according to a Singer dealer we were talking with. 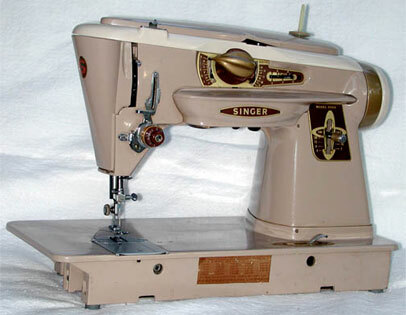 The wavy pattern on the red and black quilt fabric banner above was sewn using this Singer 500. The needle is slanted bringing it closer to the user for better visibility. There were arguments that the slant provides better penetration, but we wonder about that since it seems farther through fabric at an angle than straight through it. We have seen one sew through eight layers of denim and some claim they can be used to sew canvas, etc. Ours only sews two thickness of 100 percent cotton quilt fabric! When it comes to a vintage all-metal machine that is the most versatile using built-in capability, this is our best one. 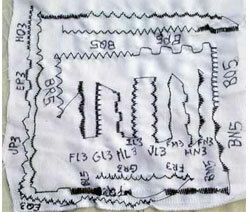 By varying the two controls on the top-center of the machine, a wide variety of stitch patterns emerge. Also, cams or special disks can be purchased which increases the number and variety of stitch patterns. Some folks claim this is the last of the good metal machines. After making these machines, the industry began using space-age plastics for some parts, however, the change effects the way the machine sounds and feels. There is no question that the newer machines have more capability such as drawing graphics, stopping the needle at the desired point, ease of making buttonholes, etc. Still, for those of us who like all things mechanical, we prefer heavy metal. The 500A Slant-O-Matic feature moves the needle over 1-inch closer to the operator. The average bed is 7 inches wide and the needles are usually centered. On the Slant-O-Matic, the needle is less than 2-1/2 inches from the edge of the bed. 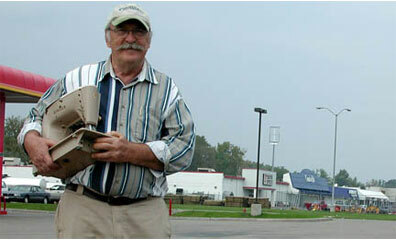 This is a significant difference for some of us old people with failing vision. We have two of these machines, which were found within a few days of each other. The first 500A we obtained was found sitting beside the road for any passerby to pick up. It also contained an accessory pack containing five special cams. Although the machine was free, we spent nearly $200 to get a minor repair and purchase a few more disks and other accessories designed just for the slant needle. For the sample, Jim moved the selectors to different position to see a few of the various patterns produced using built-in features of the 500A. The notations represent the setting of the outer dial, inner dial, and stitch width.